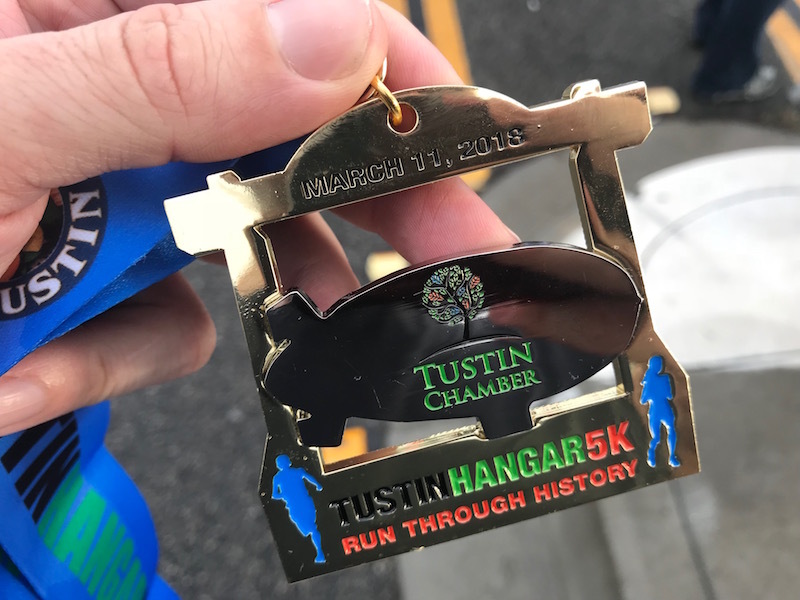 Running Through World War II History (Tustin Hangar 5K Race Recap) | Keep It Up, David! 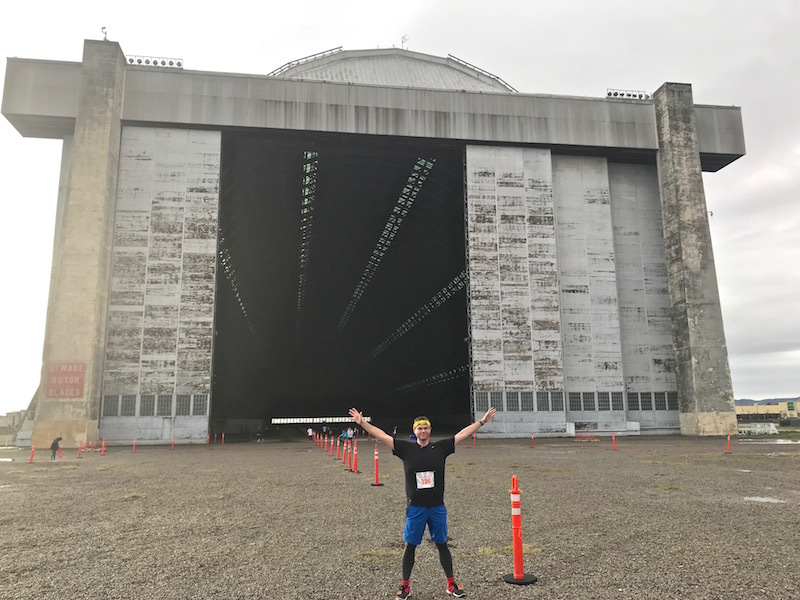 The race was the Tustin Hangar 5K, and I signed up a few months ago, for one reason and one reason only: The Tustin Hangars. They’re a piece of American military history, hiding in plain sight in the middle of the suburbs of Orange County. They’re closed off to the public, except for during one event: this race. The race was a big deal – over 7,000 runners, competing in either the half marathon or the 5K. I did the 5K. 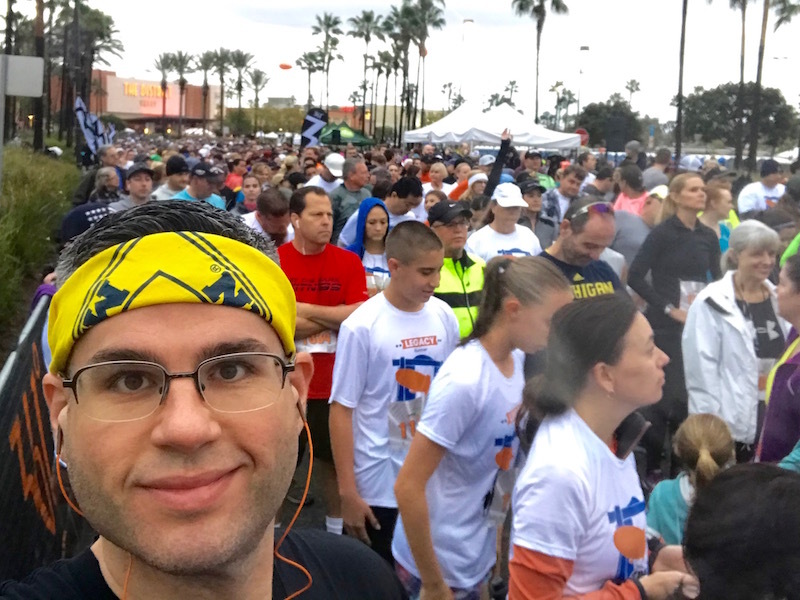 There’s nothing noticably special about the race at first glance – the start and finish lines were in an enormous, suburban shopping center in Tustin, California, between a Target and a Petsmart. It’s only after the race begins, though, that you begin to see what’s so awesome about it, and you see it for the first time as you round the first corner. That, my friends, is a gigantic blimp hangar. How gigantic? 1,000 feet long, 300 feet wide, and 17 stories tall. There are two of them, built in 1943-44, that served as the base for a Pacific fleet of airships (blimps). After the Japanese attack on Pearl Harbor, there was fear that the Japanese might attack our mainland. So the US Navy implemented a program where blimps monitored the coast, as well as popular shipping routes. These blimps were heavily armed with guns, bombs and depth charges, and are credited with preventing Japanese submarines from ever getting too close. Approaching the giant, sliding panel doors. Each one is 120 feet high. Each of these hangars could hold six blimps, and are some of the largest all-wood structures on the planet: each one covered over five acres, under one roof, with any interior columns or supports. One hangar has not held up well, and due to compromised structural integrity, may be torn down in the near future. 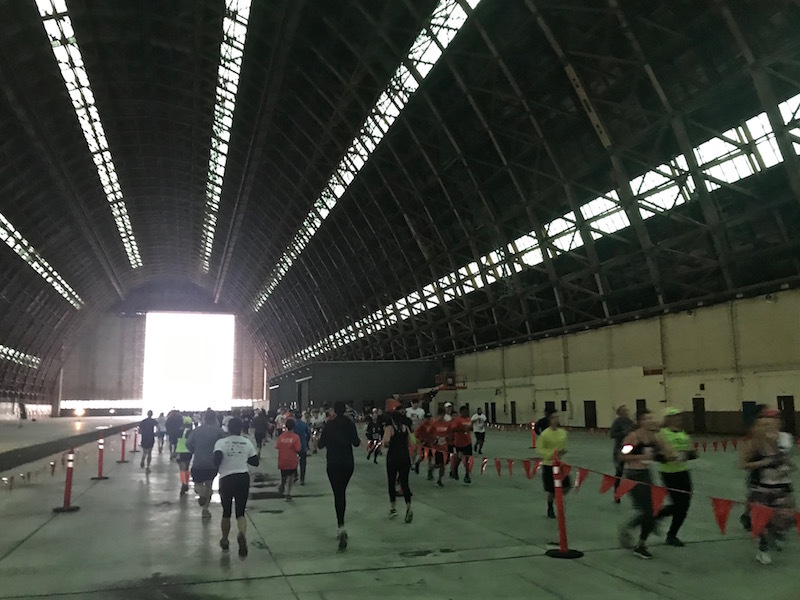 But the other hangar is in pretty good shape, and the route of the Tustin Hangar 5K allowed us to run down the entire length of the soaring, cavernous interior, striped with skylights, and back again. So completely awesome! The blimp program ended in 1949, but the hangars saw new life during the Korean War, when they were the base of operations for military helicopters. Ultimately, though, the Marine Corps Air Station Tustin closed for good in 1999. The hangars still stand, while the rest of the land around them is slowly getting developed into apartments and shopping centers. 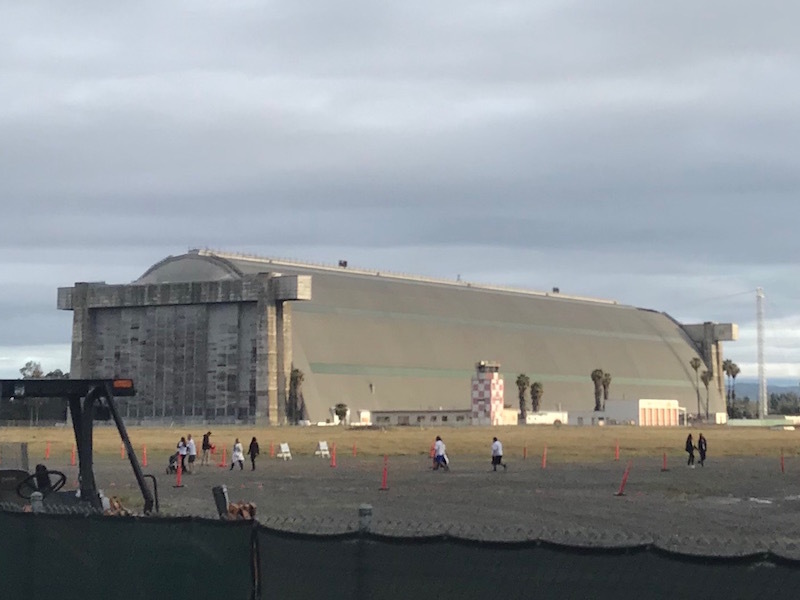 The hangar was by far the highlight of the route during the 5K. After exiting the hangar, we ran up and down a road, past the loading docks for a Costco and Lowe’s, and back to the staging area and finish line. During the final kilometer or so, I started fixating on what the finisher’s medal might look like. It better feature a blimp! I finished the 5K in 30 minutes, 48 seconds. I had no goal or expectations for this race. It was merely a reason to check out the hangars, and get in a good workout. That said, I’m pretty happy with my time. 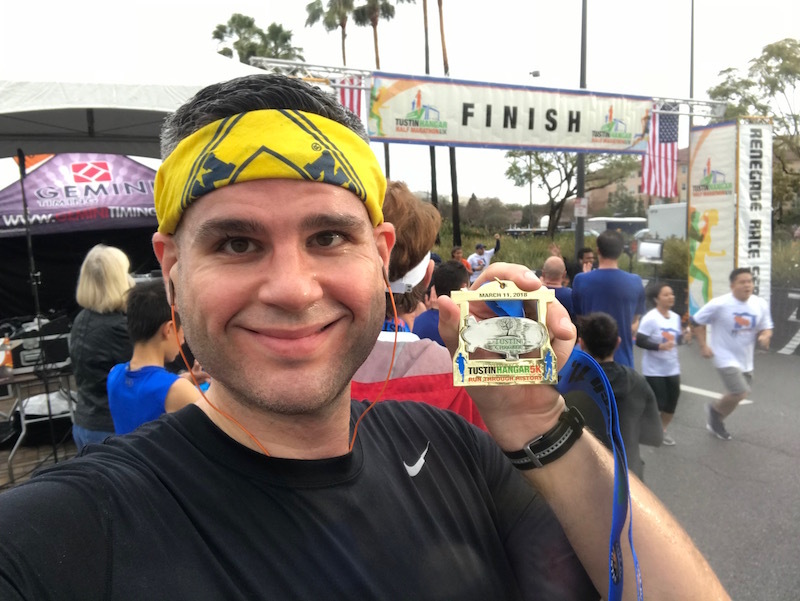 I haven’t done a timed 5K race in almost two years – not since the 2016 LA Pride Run – and I beat my time from that race by about 40 seconds. And my average pace was 9:55 – very cool that I broke 10 minutes! I didn’t even bother checking how I did compared to the rest of the pack, although I did notice, while plugging my name into the results database, that out of the seven people with my last name that raced, I came in third! 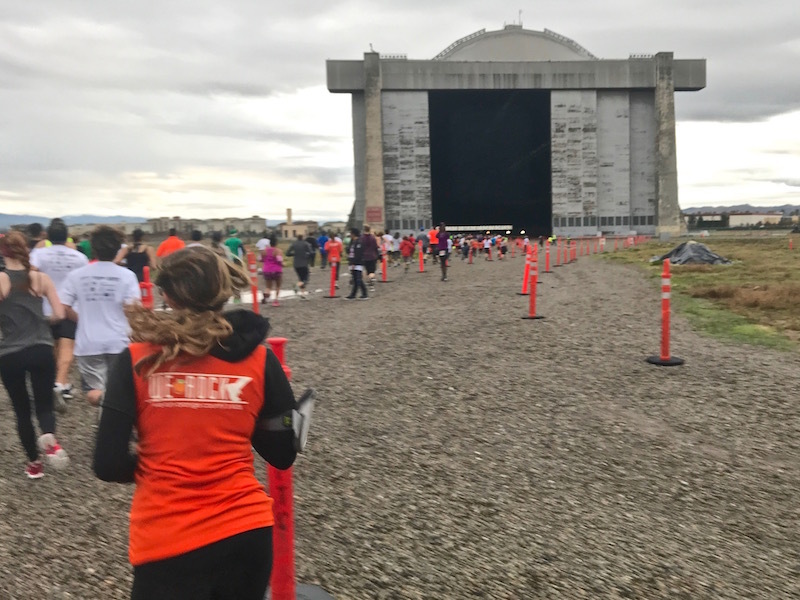 A couple minutes after I crossed the finish line, I started walking back towards the hangar – I wanted to check it out when there weren’t hundreds of people running through it. When I got there, race volunteers were packing up the cones that marked the course. I asked one to take my picture. And then I stood for a few minutes, just inside those massive doors, imagining this place humming with activity, blimps being guided in and out. I woke up at 5am and drove 50 miles to go for a 30-minute run. I got to experience this place, soaked with 75 years of history. What a great way to spend a Sunday morning! 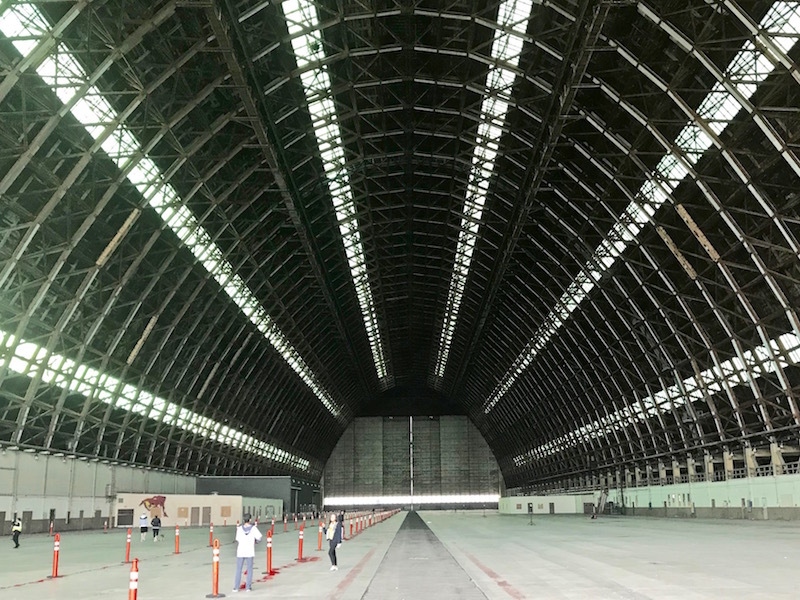 If the Tustin Hangars look familiar to you, it may be because you’ve seen them in “Star Trek,” “Austin Powers,” or “The X-Files.” For more on the Tustin Hangars, check out this great 25-minute documentary on YouTube. This entry was posted on Monday, March 12th, 2018 at 12:07 am and is filed under Uncategorized. You can follow any responses to this entry through the RSS 2.0 feed. You can leave a response, or trackback from your own site. How cool is that!!! I love races that have historical meaning to them. Also, that medal is sweet!! I agree… and I AGREE! Wow David!! This is nothing but very cool to see! Thank you so much for sharing such a piece of history with us! I can only imagine how incredible it must have been to see this. I had to pick my jaw up off the floor! That’s so cool! I used to live in Irvine – my dad was a Marine and we lived on El Toro (which is also now closed). I have lots of memories from high school in the Tustin area and would have loved to check out these hangars! Thank you! It was awesome. Maybe you should come back for next year’s race! The 5K is a run/walk, so even folks that aren’t runners can participate.